Can I collaborate on items with my colleagues? Has commenting on an item been improved? How can I add notes to an item? Where has the 'Save' button gone? How can I save my content? How can I view the HTML of a field on an item? I can't see how to add entries items. Help? How can I make a field plain text? How do I set a word or character limit for a field? How do I re-order the fields on my item structure? How should I add starter content to a field on an structure? Will the improvements make it faster for me to edit my item structure? Why can't I choose which workflow status to move an item into? I can't find the People tab in my project. Where can I manage my people on the project? What's changed with exporting content? 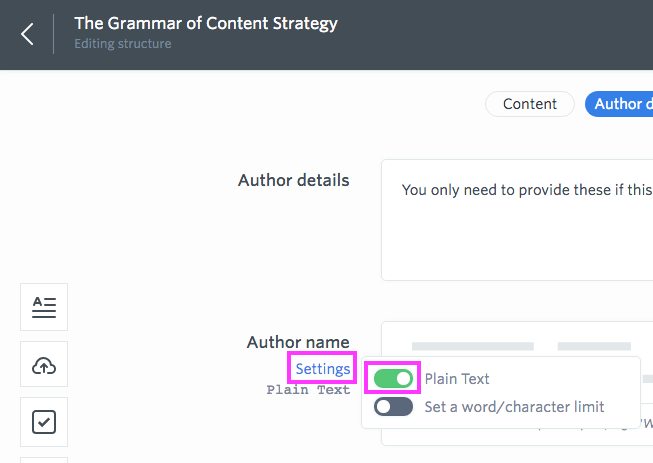 What's changed with importing content? How does this affect our CMS integrations? Yes, absolutely. 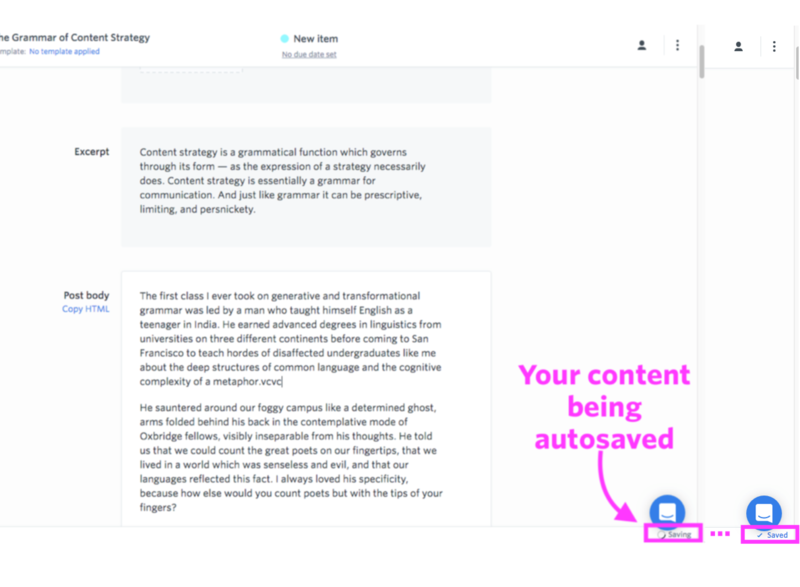 You can now work on content with your team simultaneously and edits are shown in real-time. See more about Collaborating with others on an item. Yes, comments now support emojis, and will soon support @ notifications. You can also comment on plain text fields and assets. You can add notes to a guidelines field and reference any information or attachments from there. You can copy the HTML of a field by hovering over the field and clicking the 'Copy HTML' link that appears underneath the field name. Then you can paste it elsewhere to view or edit it. You can also view and copy an entire item's HTML. We've removed the ability to add entries items. We recommend adding standard items and applying a template, which would correspond to the structure of your parent item. In template/structure edit mode, click the 'Settings' link underneath the field name. There you'll see a toggle you can switch to Plain Text. In template/structure edit mode, click the 'Settings' link underneath the field name. There you'll see a toggle you can switch to set a word or character limit. In template/structure edit mode, click the 6 dots at the far-right of a field and then drag your field to move it elsewhere. Where can I add starter content to a field on an structure? 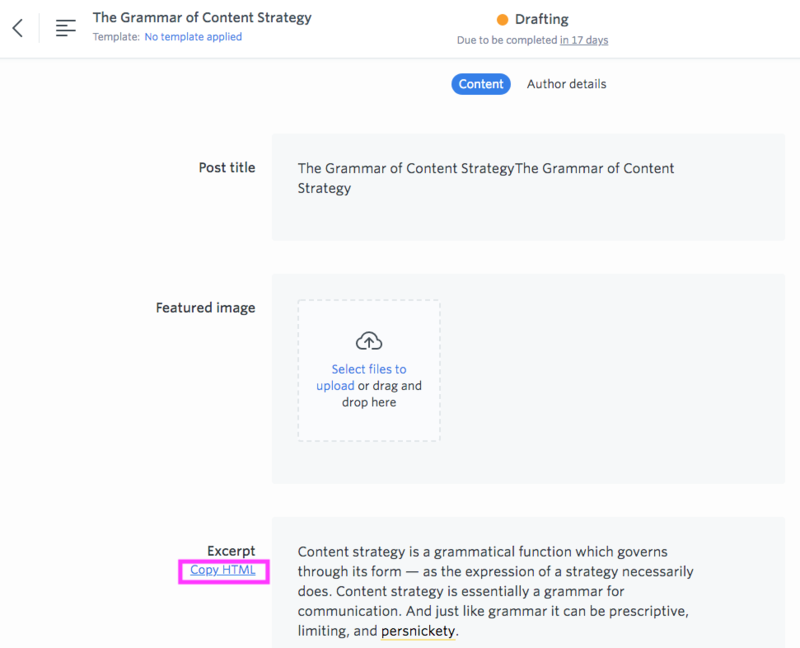 We've removed the ability to add starter content to a field on a template. You'd need to add this to the field on the item itself, to make it visible for the content writers when they begin working on the item. You could also add it to the instructions text below a field on the template, so it's there for reference. Yes, absolutely. A big reason for the improvements we've made were to better support complex structures on items. We've made the workflow linear, to discourage people from skipping workflow steps. 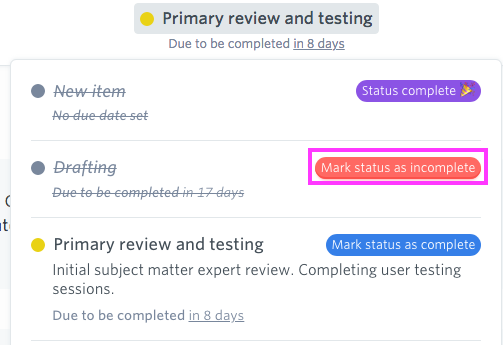 To move an item to a specific workflow status that isn't next in the workflow order, you'd need to move the item through each status, and then 'Mark status as complete' until you arrive at the desired status. 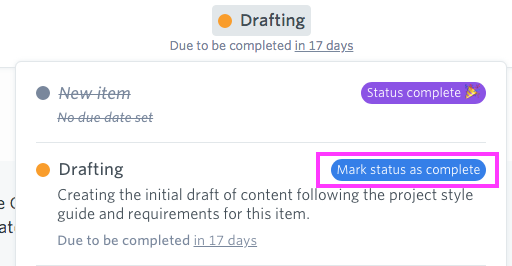 If you need to move it back along the workflow, hover over the last completed status and click 'Mark status as incomplete'. 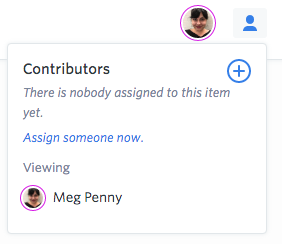 You can manage your people centrally across your GatherContent account, by clicking on your avatar in the top-right corner of GatherContent and selecting 'People & Groups'. If you don't see this option, you may not have permission to access the People & Groups area. The process of exporting your content is the same. The only thing that has changed is that the Connect & Export tab is now called 'Migrate'. It can be found in the main navigation. We've temporarily disabled the ability to import content from a spreadsheet (CSV/XLSX). This is while we work on improving the import from CSV functionality, which we'll be re-introducing soon. What's changed with the structure editor? What's changed with the content editor? Got a specific question about something that's changed that's not covered here? Feel free to drop us a message using the blue bubble at the bottom right of this page. Using one of our integrations? You'll need to re-set your template mappings after your account has been upgraded. This is because the structure of templates is different in your upgraded account. You'll need to open your template mappings in the GatherContent plugin/module, in your CMS. Then, update the template mappings to ensure that all the field mappings are set as intended.